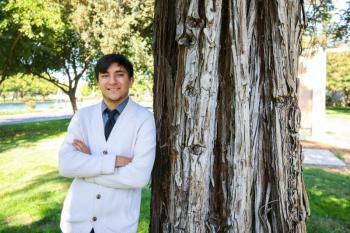 Overseeing 3,543 trees on a 228-acre college campus is a daunting task, but an interactive tree story map  completed by Stanislaus State senior Germán Silva is helping University staff meet the challenge while serving as an educational tool for botany students. The final map, posted on the Stan State website, shows an aerial photo of the campus with each tree clearly defined. When users select a tree, they can view pop-up boxes that contain the common name, Latin name, a photo, tree characteristics and other useful information. The only trees not on the map comprise a small teaching orchard near the Trans-California Pathway Project. The electronic map is used regularly by facilities staff members who need an accurate tree inventory to manage the campus landscape. The map is also used by botany students for working on tree identification, specimen preparation and DNA barcoding projects. Silva is quick to share credit for the map with students who worked on it before him. The project began in 2011 as a geography class project by alumnus Don Rajewich, who used GIS to catalogue and record the locations of the majority of campus trees and create a paper map. In 2016, the map and tree catalogue were updated and expanded by alumnus Juan Gutierrez, who preceded Silva as a facilities intern. When Silva started his internship in June 2017, the paper map had been scanned as a PDF and stored electronically, but it wasn’t accessible to people with visual access needs. Silva proposed an online, interactive map that could be posted on the Stan State website and would be compatible with the screen reading software used by people with visual access needs. While planning the map’s design, Silva expanded the original tree list into a detailed database and, in the process, he learned a lot about trees. “It had to be a project of patience for Germán because you can’t identify some of the trees until they are blossoming,” said Julia Reynoso de Valadez, director of Capital Planning and Finance. That meant Silva had to wait for some trees to blossom so he could collect flowers to make accurate identifications. To ensure that he identified the trees correctly, Silva worked with Stuart Wooley, professor of botany, and Andrew Gardner, assistant professor of botany. Having watched the evolution of the map over the past seven years, Wooley notes that everyone who worked on it impressed him with their diligence, and he commended Silva and Van Eyk for their efforts on the latest version. Gardner finds the map very useful for two botany classes he teaches. In his introductory class, students use it to explore the trees on campus and learn about tree identification. In a more advanced research class, students are using it as they complete a collection of dried plant specimens for the Stan State herbarium. They also use DNA barcoding to identify individual trees, study the structure of the campus’ plant community and estimate the evolutionary history of the trees. Gardner sees the map as an important tool that can also be used to make decisions about the future of the campus landscape. Tracking plant health with the map could illustrate the diversity of species that thrive in Turlock’s climate and soil, providing an exciting teaching tool for both students and the general public. “As someone who is trying to teach people about plants, having a campus with such tree diversity is great because we can just walk out and put our hands on them,” Gardner said. Wooley is looking into whether the Stan State campus, with more than 100 species of trees, could be accredited as a level 1 arboretum by ArbNet, an interactive community of arboreta managed by the Morton Arboretum in Illinois. The tree story map would serve as an important supporting document for the ArbNet application. “We are all about education at Stan State, and if the campus qualified as a level 1 accredited arboretum it would be a great way to educate and connect with the community in a very positive way,” said Wooley, who noted that an arboretum designation would include a commitment to conducting educational programs and an annual public-outreach event. Silva is also looking to the future. He expects to graduate with a bachelor’s degree in May and he is planning on a career in coastal or forest management. He sees the map project as an important component in his portfolio of work because it shows he already has valuable skills and experience in managing natural resources.